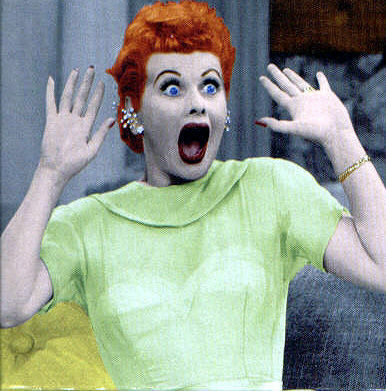 Cold calling is dead, at least as we know it, according to Forbes contributor Ken Krogue. Wait a minute, perhaps not. Matt Heinz, President of Heinz Marketing, blogger and author, holds the contrary view in his post If you think Cold Calling is Dead, You are Doing it Wrong. As it happens, for every article heralding the end of traditional cold calling there is another extolling the virtues of the very same thing, providing you just do it right. Most only seem to disagree in the headlines. Who Decides if it is Alive or Well? When I speak at sales conferences and workshops, I often ask the assembled group of professional sellers ‘Who really enjoys cold calling?’ Inevitably, I will see one or two defiant hands reaching high and I have made it a habit to seek them out during a break to find out more. They are invariably resilient, optimistic and interesting people. However, I am not sure I am asking the right crowd. If I asked a room full of business buyers ‘how many of you enjoy receiving a cold call?’ then I suspect I would see either no hands or a similarly small number. In fact a study on buyer preferences commissioned by IBM revealed that cold calling is 97% ineffective. As buyers, we simply do not like the intrusion. It is difficult to believe that businesses would continue with any activity that only works three times in a hundred let alone an activity that is not welcomed by more than 9 out of 10 of prospective customers. Is it the Right Question? Those three positive connections must seem pretty good to the caller after ninety or so curt and dismissive responses. I have heard it called ‘living for the yes’ a euphoric high as a result of affirmation after a truck load of human rejection. I have nothing but admiration for those that do it, do it well and manage to stay positive dial after dial. However, it seems to me that we are asking the wrong question of the wrong people. We are living in the age of the connected buyer. Sophisticated business buyers that use online resources and their professional social network to make their purchasing decisions. These, often senior decision makers, prefer to find their own information and validate with social proof through those they trust. Connected buyers are in control of their buying process and are simply not interested in being invited into a sales process at the wrong time through a cold call. 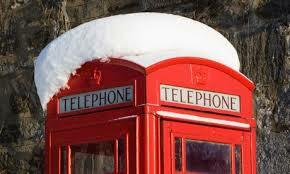 Whilst my audience of business buyers is hypothetical, all the evidence is that they want cold calling to stop. This is why they screen their calls and don’t return messages. It is also why receptionists, office managers and assorted colleagues tell sellers that the target of their call is ‘with someone right now’ when they are not. Business buyers have wanted cold calling to end for a very long time, Seth Godin introduced the term interruption marketing in the 90’s and it wasn’t a new problem then. For sellers, cold calling may be dead. Or it may not. For business buyers and decision makers though, its demise, whenever it was or is, will not have been soon enough. As our own business grows, I find myself more frequently in the role of a business buyer. It is a stark reminder of why we do what we do at Artesian. A meeting with a potential supplier, only a few days ago, was a classic example of what will now be forever known to me as CC Bloom Syndrome, a behavioural trait described by Forrester’s Scott Santucci in his blog post Closing the Divide Between Sellers and Executive Level Buyers: A Plea ! Three colleagues and I sat through a forty five minute demonstration peppered with questions and answers. Our time had been well spent and having done a great job, the pre-sales consultant handed back to the seller. At this point we were asked how we would now rank their product against others we had seen. The preceding highly interactive session had revealed much about our specific needs. We’re an interesting company, in a growth space, tackling a new market, well funded and introducing new systems and processes around old ones that we are outgrowing. I didn’t understand why he didn’t have more questions about, errr, us. Instead, like the character CC Bloom in the film Beaches, we were asked Anyway, that’s enough about us, over to you, what do you think about us? Our seller hadn’t appreciated that the world has changed. He hadn’t figured out what our business, a business that has social selling at its core, would want from a seller. Irony upon irony. In a world where the dynamic between buyers and sellers has changed dramatically there are at least five new imperatives to observe, to underpin each and every customer interaction. I make no apology that the tone is inspired by the Cluetrain Manifesto one of the most prescient pieces ever published on the future of business. It’s the Buyers Process. I am not part of your sales process, you are part of my buying decision. Like many B2B buyers according to research from the Corporate Executive Board, by the time I contact you I am 57pc of the way through my decision. That’s right, if it was a sales process, then how did I get more than half way through it without you? Buyers Needs are increasingly Transparent. We are all busy but I will have done some research on you, your products and your competitors. Many of my needs as a business buyer are identifiable from news about my company, from my LinkedIN updates, my tweets and blogging. It is all out there so return the favour. Do the Right Thing. I don’t need an introduction to your existing customers, I can find them, their views and what it is to work with you today because all of these things are on-line. I will not take any single view, rating, recommendation at face value. Connected buyers are more sophisticated in their use of social media than that. We are looking for patterns. Ask yourself, have you been doing the right thing for your customers? I will be. Be Authentic. Like most B2B buyers, according to a Forrester survey, I have read three pieces of content for each carefully created corporate marketing piece you offer me. And, as a connected buyer I place more trust on the views of my extended network anyway. Don’t position, posture or handle my objections with pat techniques or scripts. Instead, be open and honest. I am not looking for perfect, few of us are. But I demand authentic. Exercise Leadership. Much is said about power shifting from seller to buyer but the new reality is parity, not control. I understand that wherever there is change there is sales. Sellers that exercise leadership help us challenge the status quo, provide answers and offer direction. You should be good at this stuff, you have been on this journey before. The social seller then is not waiting for a key word in the conversation so that she can launch into a sales pitch. Instead she is looking to understand, to learn, to help and to lead. The social in social selling is less about the media, the tools and the platforms and more about recognising the 5 imperatives. To serve the buyer and proactively interpret their need as a result of being immersed in their customers world. Understanding, openness and authenticity earns trust and builds reputation that gives social sellers the right to take a leadership role taking them and their customers to a place of mutual success. For those that continue to ignore the changing dynamic between buyer and seller, the Cluetrain will keep stopping … perhaps they should take a delivery. I often post on the impetus for social selling; why sellers need to adapt to the changing world of the social buyer. I am not alone of course. It is the subject of any number of books including the New Handshake (Joan C Curtis, Barbara Giamanco) , eSelling (Sean Mcpheat) and is at at the heart of Dan Pink’s latest To Sell is Human where Pink articulates the changing dynamic between buyer and seller as a change from Caveat Emptor to Caveat Venditor. The inevitable question is where all of this taking us? To me the answer is not emerging in the world of CRM but in the thinking around Vendor Relationship Management (VRM) Doc Searls, one of the Cluetrain authors, in his book The Intention Economy, vividly describes a world where the systems that manage the relationship between buyer and seller are owned and operated by the buyer. Communication between the two is not controlled by monolithic supplier side systems and processes but by a multitude of buyer side applications. The first clue to the future of CRM is that it is not the Customer being managed. It’s the vendor. I was thrilled then to read a post from Anshu Sharma, in enterpriseirregulars.com which makes exactly the same point. Sharma suggests that the new breed of CRM is here, it is inherently vertical and it manages the relationship from every perspective. It is apps. He points at Airbnb, Uber and OpenTable amongst others where the customer is driving the relationship not the vendor. Applications like Tripadvisor allow customers to book hotels, flights, restaurant tables but supported with the social validation of others. We are becoming sophisticated social buyers, looking for patterns in ratings from others rather than being swayed by a single positive or negative review. We can all spot the overly enthusiastic and the terminally underwhelmed. Sellers are, quite rightly, getting a voice too. Sellers get a right to reply and they get to describe their own property, menu or venue. They have to keep it honest though. Social is not like traditional marketing platforms and those that misguidedly think it is are taken to task. JP Morgan executives started to think that their tweetup was a bad idea when their #askjpm attracted questions like ‘Is it easier to purchase a congressional representative or a senator?’ When the number of abusive posts reached two out of three they called it off. Sharma uses one of my favourite quotes; William Gibson ‘The Future is already here – its just unevenly distributed’. If we are looking to the future of CRM I would suggest that it still has a long time to play out. Like Sharma, I can see Salesforce becoming a $10 billion dollar baby and adapting to the increasingly social buyer. Beyond this though, you can see the future in fragments of apps and social platforms and sellers are going to have to deal with massively increasing complexity. The future of CRM is a misnomer. It is not one where sellers manage customer relationships at all but one where they are being managed on the customers terms. It can’t come too soon. According to a 2012 study from the Aberdeen Group, those that have adopted a social approach to selling are achieving far betters results than those that have not. Look at quota attainment, customer rentention even forecast accuracy and social sellers come out on top. As we enter another New Year, social sellers are proving to be more successful. Outwardly, Social Selling is about making use of social platforms to communicate with their prospects, customers, channel and colleagues. However it is not tools that define a social seller, instead it is how (and why) they use the tools that sets them apart. According to the 2013 B2B Lead Generation Report by Holger Schulze, over 90% of B2B buyers begin their buying process online. Those sellers that have a presence and are contributing will be engaging with their customers far earlier than those that are not. Those sellers that do not have a profile on the major social platforms will not be noticeable by their absence. They will just be absent. Social sellers maintain a professional on-line presence so that they, not just their companies, can be found when their prospects begin their buying process. Maintaining a presence is just the start for a social seller. They want to be active in the communities they serve, educating, sharing, moving the conversation forward. Those that sell payment services spell out what new regulation might mean; those that sell unified communications explore how telepresence impacts an increasingly mobile workforce. There is more to a Social Seller than their products and services. They are focused on the challenges and opportunities that their customers care about. Listening is the subject of countless books, is one of Dale Carnegies ways of influencing people and one of Stephen Covey’s habits of highly effective people. All social interactions begin with listening and the new world of social platforms is no different. By listening Social Sellers gain insights into their customer and understand their priorities. They listen carefully so that when their customers are ready to buy – they are ready to help. Selling, in my view, has much in common with leadership. As sellers, we need to engage our buyers by knowing what their opportunities and challenges are. We can then offer a fresh and external perspective on how to meet them. Sellers are catalysts for change but buyers naturally have their own ideas of what works well, and it’s not easy to challenge the status quo. Change comes from being a leader, from offering your customers new ways of thinking about their business. I have some issues with the The Challenger Sale: Taking Control of the Customer Conversation by Matthew Dixon and Brent Adamson, not least of which is that I don’t believe sellers have a right to take control of the customer conversation. However, the key to Matthew Dixons and Brent Adamsons text is that sellers have a responsibility to challenge the established position. Social sellers have lifted their game beyond understanding their own products and services. Instead, they understand their customers markets, invest in the issues their customers face and demonstrate thought leadership. Social Sellers are seeing early success. They are retaining their customers and making their numbers. They are not achieving this by simply being on LinkedIn, following Stephen Fry or Tweeting about their flight delays. They are adapting to a new environment. They are adding value, building trust and creating meaningful relationships. What’s more they are unconstrained by limitations of time and distance because they are using online social platforms to extend their reach into new communities previously unaccessible to them. Most importantly though, they are establishing themselves in a new environment, an environment where their customers are already comfortable. Social sellers are getting ahead whilst those that refuse to see that their customers live in a new world are falling behind. By the end of 2013, the voice of the social buyer grew stronger and louder. Were you around to hear them so that you can change in 2014? When I was asked to speak on social selling to a group that comprised senior executives from the insurance industry recently, the immediate and obvious subject was trust. After all, It is difficult to think of an industry more dependent on trust. With this in mind, I reached out to my network for ideas and I was directed towards three great reference points. Stephen Covey, who I was privileged to see speak at Leaders in London many years before his sad passing, often spoke of the high cost of low trust. In fact he maintained that trust in all businesses was not just important but essential. The IBM Institute of Business Value study, Insurance, Intermediaries and Interactions (Dec 2012) took input from 8,500 consumers and 1,300 intermediaries in 17 countries. What they discovered was that trust in the insurance industry has been low since the studies were started in 2007. In fact, in the current study, 56% answered no when asked do you trust the insurance industry? Eek ! Interestingly no one in the industry is surprised by this and whilst is has increased (slightly) in the 2012 study no one in the insurance industry is happy about it. The study also identified that trust is highly correlated to loyalty. The people in that room, all experts in insurance, could assess what churn, the consequence of a lack of trust, costs them far better than I ever could. However, I think it would be difficult to argue with Covey’s wisdom that there is ‘a high cost to low trust’. What interested me though is that whilst customers don’t trust the industry, they do appear to trust people. Three quarters of respondents in another IBM study, Trust, Transparency and Technology (these studies are also exercises in alliteration) said that they did have trust in their personal insurance adviser. Consumers don’t trust the insurance industry but they trust the people they buy their insurance from. In fact, more than half of those studied still buy from a person. In a time when there is less and less human interaction in business (think Amazon) it remains a foundation for insurance because of all the forms of interaction, we trust human interaction the most. However, it can’t have escaped anyones attention that the way we interact has changed. Interaction is digital. Insurance customers are using social platforms as part of their buying process. More than 70 percent of study respondents use one or more social networks. They might ultimately buy from a person but the purchase is just one of many interactions. Like many complex products, there are a lot of interaction points. Websites, aggregators and increasingly, social media are replacing many of those face to face interactions. Customers might not be concluding their final transaction on-line but they spend 60% (and more) of their time being influenced here. Who is responsible for trust? So who (insurer or intermediary) is responsible for building and maintaining trust? Whilst much of maintaining a personal relationship is something that intermediaries have been doing well for a long time it would seem that it is not that simple. The 3i study refers to a rare experiment in behavioural insurance conducted in 2011. The experiment was carried out at the Institute of Insurance Economics in Switzerland. One of the findings of the study was that customers see a perceived lack of quality as a reflection on professionalism and training i.e the fault lies with the intermediary and the insurer. With issues of reliability, customers see this as a reflection entirely of the insurer. Even a great intermediary cannot sell a poor product. The experiment shows that the personal side of being a trusted adviser is only one part. Maintaining professionalism, knowing customers personally and treating them personably is something the vast majority of intermediaries have been doing for as long as they have existed. But intermediaries cannot do this alone. In fact the report concludes with a recommendation for insurers. Insurers have to provide support. That can happen through training, through a corporate culture of customer first, through good and consistent products and messaging, and, last but not least, by giving intermediaries the tools and data they need to serve their clients well. It would seem that even in a highly intermediated market trust is everyone’s responsibility. In Daniel Pink’s To Sell is Human, Pink suggests that buyers and sellers have moved from caveat emptor to caveat venditor. Sellers are no longer the first point of contact when buyers want to know about our products and services. Google is. Sellers are not even going to our web pages. They are going to their networks. According to a study from the Corporate Executive Board, buyers are almost 60% of the way through their decision before they even speak to a seller. They don’t need sellers until much later in their purchase cycle. They are better connected through social platforms like LinkedIn and Twitter than they have ever been before and they trust each other before they trust sellers. Think about what this means in terms of measuring not only the performance of a sales team but their behaviours. In the diagram above is a set of quadrants that demonstrates how sales managers have historically managed their team. On the y axis is performance, on the x axis behaviour. 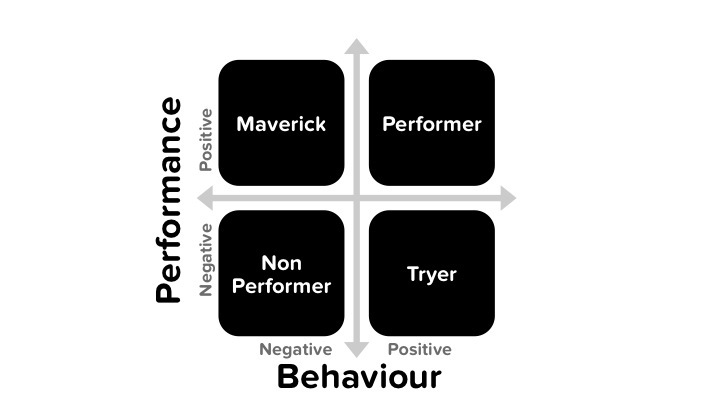 In the good performance/good behaviour quadrant are performers. If we do anything with performers it is about them helping and coaching others to their level. They set the benchmark for the rest of the team. In the poor behaviour/poor performance are non-performers. These are likely to be going through some performance improvement plan. An enlightened sales manager will work with Tryers. Tryers are doing all the right thing but not getting the right results. With expert coaching, time and attention their performance usually follows. Finally, there is the Maverick quadrant. These sellers exhibit good performance but poor behaviours. Let’s face it, Mavericks, have historically been tolerated. Their contribution to the quarterly numbers is tough to resist. In any case, their performance will eventually drop at some point so sales managers play a waiting game. When it plummets, and given that the Maverick’s underlying behaviour – it will, they are unceremoniously exited. However, the damage has already been done. If we are lucky, their short-termism was only making them unpopular with their co-workers. The Maverick will often be heard hurumphing around the office complaining about the ‘sales prevention department’ which was variously finance, services, sales support or whoever it is that has identified a flaw in their latest ‘deal’. Equally as likely though, they are mis-selling or overselling and creating a legacy of customer problems and problem customers. Few customers keep these problems secret. With complete control of a sales cycle though, sellers could steer around the debris. In a socially enabled world, not so much. And empowered customers are sharing it with their network. Their always-on, global network. A tweet or a LI status update can reach tens of thousands of prospective customers. Competitors too. It is also a permanent record. Some of that buying cycle (the 57% invisible to the seller) can be used to find out what existing customers think. Good selling behaviour leaves behind a trail of satisfied customers and positive comments. Poor behaviour also leaves a trail. The maverick can no longer be tolerated. Caveat Venditor. In To Sell is Human, Pink also demonstrates that the networked age requires more not less sellers. More of us sell than ever before and those that don’t have to persuade, convince and compel as part of an increasingly creative and collaborative workplace. Pink calls it non-sales selling. We all need to be better sellers. However better can no longer be defined by the numbers. It can not be determined by performance alone. Instead, it must be measured by how we conduct ourselves, by our behaviours. In short, to be better sellers we must be better humans.